Holy cow, it’s been awhile. With the State High School Baseball Tournament occupying CHS Field for almost the last two weeks, the Saints have not played a home game since May 28th. In other words, a lot has happened since we last talked. So, let’s get right to it. When playing at home, it has almost been a lock that the Saints would come away with the series victory. The Kansas City T-Bones must not have been told, with the away team taking two of three from the Saints in front of a packed house every night. The first two games in St. Paul provided plenty of offense and the teams took turns flexing their muscles. Kansas City used two three-run homers to help top the Saints 10-5 on Friday night, though the Saints used a six-run third inning to turn the tables back in their favor, winning Saturday’s game 10-3. In the finale, the Saints had multiple chances to go ahead but were unable to get a hit when it was needed, stranding twelve runners in the game and losing 5-2. My MVP for the home stand is Nate Hanson. Hanson hit an impressive .428 with 2 doubles, 3 runs scored, 3 RBI and 2 homeruns, while also playing stellar defense at third base. Promotion highlights from the home stand included Ila Borders being on hand for her bobble head giveaway and signing copies of her book, Making My Pitch, outside the front gate prior to Saturday night’s game. Borders also was in town the day before and hosted a Girls in Baseball camp, teaching young girls the fundamentals of the game. Rounding out the weekend was all out craziness on the field like only the Saints can do. After Sunday’s game, not only were kids able to run the bases and get autographs, but everyone could go on the field for the Memorial Weekend food truck rally followed by a fireworks super show. Fans and players filled the field to enjoy the festivities. After the late night, the Saints embarked on their longest road trip of the season: a two-week bender that had our boys playing thirteen straight games away from home. The first stop on the trip was in Cleburne, TX for a four-game set against the Railroaders, followed by a three gamer against the Salina Stockade in the same ballpark. The first four games at Depot Stadium were split at two apiece. 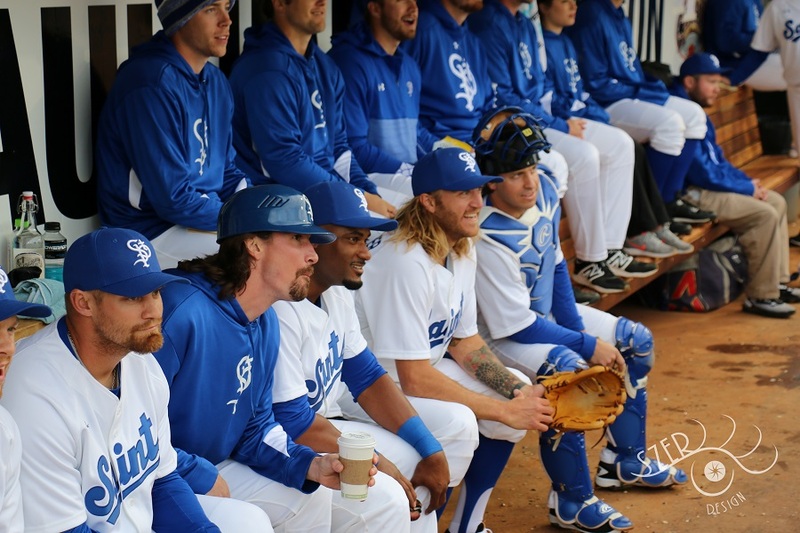 Highlights from the series were a 15 inning, 5-hour marathon game one win for the Saints. The 5-hour game is a new franchise record for the Saints in terms of actual game time. Also, newly signed Ryan Zimmerman tossed six solid innings and allowing only one hit and one run in a 10-2 game three victory for the Saints. Zimmerman played the last two seasons for the Sioux City Explorers, winning 14 games for them in 2014. Next up in Cleburne were the almost homeless Salina Stockade. After being added to the league at the last minute to replace the Laredo Lemurs, Salina only plays a very limited amount of games at their home ballpark, Dean Evans Stadium in Kansas, since the schedule was already made prior to Laredo dropping from the league, and Texas is a long way from Kansas. So the Stockade were visiting Cleburne too, just like the Saints. In a hard-fought, rainy series, the Saints swept the Stockade three games to none. In the process the Saints began a six-game winning streak, which propelled them back into the first-place race in the North Division. Tony Thomas and Nate Hanson were once again key to the Saints offense in the victories. Thomas delivered the biggest hit of the series, crushing a go-ahead two-run shot in the seventh inning of game three, giving the Saints a 3-2 lead they didn’t relinquish. Hanson continued his hot hitting, earning himself the American Association Pointstreak Player of the Week from 5/29-6/4. Next up was a stop in Grand Prairie, TX for three games against the Air Hogs. The Saints easily swept the series, allowing only ten baserunners total, shutting out the home team in all three games. The three consecutive shutouts set another new franchise record on the road trip for the Saints. Game three starter (and former Twins farmhand) Mark Hamburger moved into a tie for most career complete games in American Association history with 14. After ten straight games in Texas, the Saints departed for the last leg of their trip, a stop in Kansas City. Awaiting them was the T-Bones, who seemed to not care that the Saints were red hot prior to arriving, beating our boys in the first two games with the Saints rebounding to salvage the final game, 8-3. Overall on the trip the Saints were 9-4, returning home in first place in the North Division and tied with Wichita for the best record in the league at 15-8. After fourteen days on the road the Saints return to CHS Field to face the Sioux City Explorers in a three-game series beginning tonight, Monday, June 12th. If standings and history are indicators, this series should be a good one. Sioux City is 13-7 and in first place in the Central Division and has always played the Saints tough no matter the ballpark. A quick side note; If you’re looking for team or promotion information prior to a game check out the Saints Facebook page. At 4:30pm Monday – Saturday and 2:30pm Sunday, PA Announcer Lee Adams and Radio Broadcaster JW Cox host Saints Live to give updates and answer viewer questions. Promotions for the upcoming home stand kick off with Monday Night Variety Show hosted by comedian and TV personality Fancy Ray, with musical guest Frankie Lee. Tuesday night is getting uncomfortable when the Saints debut Awkward Tuesday. And rounding out the home stand is Play Hooky Day for Wednesday’s day game starting at 1:05pm. After another short home stand the Saints hit the road for two quick series. Stopping in Winnipeg and Sioux Falls for three games apiece before returning to St Paul Thursday, June 22nd.